When I've the time I like to shop in Latte, which is just across the Italian border from Menton. There's a big and very good supermarket there called Conad and outside is a bar/restaurant. A good place to have a cup of real Italian coffee. The other day I bumped into this gentleman - it was a warm day (read hot) and he was a Hot Dog, even tho he and his owner sat under a shady umbrella. Some breeds, particularly bulldogs and pugs, find the heat difficult. 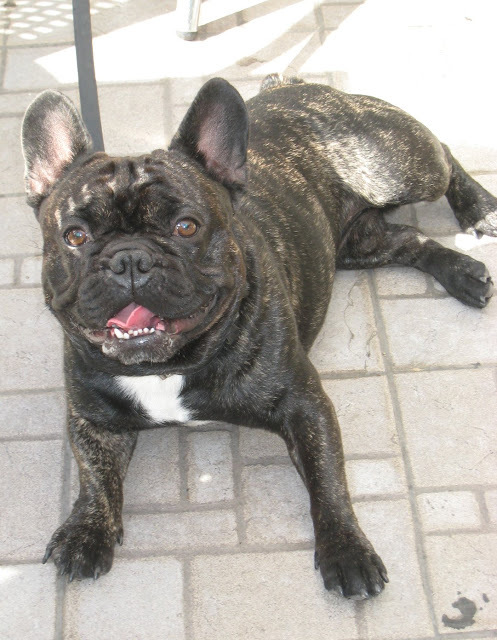 French bulldogs do a little better but they can still have problems if they are not kept sufficiently cool and only exercised in the early morning and evening. What a fabulous Frenchie ! Great photo.